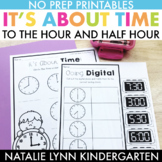 Give your 1st - 3rd graders more practice with telling time, analog style, with Telling Time: Half Hour worksheets. 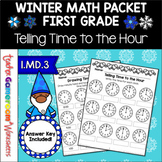 This product includes two worksheets, plus answer keys, with seven clocks on each page. The instructions prompt the student to write the correct time in the box underneath each clock. 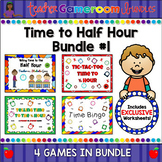 This dollar deal includes 4 worksheets, Time to the Half Hour Bump Game, and a math center.Worksheets:Magic Space (Students color the space for each hour. 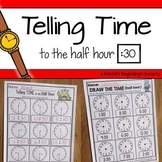 )Time Hop (Students write the time on each clock. 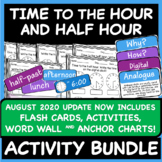 )What's the Time (Students cut out digital clocks and glues them below the matching analog clock. Telling Time to the Half-Hour MOVE IT! - What Does the Clock Say? 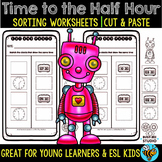 This worksheet deals with time to the half hour. 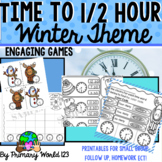 In the first half of the worksheet, students have the write the time that is shown on the clock. 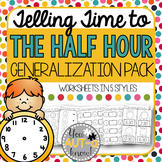 On the second half of the worksheet, students have to draw the hands on a blank clock to show the time given.